Elagabalus was born Varius Avitus Bassianus into wealth as a member of the Imperial family as his mother was the niece of Septimius Severus. At a very early age he accompanied that emperor to the British aisles where Severus fell ill and met his end. His family prospered under the reign of Caracalla and Elagabalus first appears in earnest during the reign of Macrinus, the successor and possible murderer of Caracalla. He gained prominence as a young high priest and the discontented army took notice and proclaimed Elagabalus, still in his teens, as the illegitimate son of his cousin Caracalla and the rightful emperor in May 15th 218 giving him Caracallas' name Marcus Aurelius Antoninus for good measure. Macrinus was captured and put to death along with his son. He billed himself as the high priest of the sun-god from which he took his name and once in power he proceeded to alienate almost every strata of roman society. His effeminate mannerisms and rumors of outrageous homosexual antics and the favors bestowed on lovers may explain his many failed marriages, one of which was to a Vestal Virgin to the ire of all, and his failure to produce an heir. Without an heir he adopted his cousin Alexander and promoted him to Caesar. The process of government bogged down as Elagabalus, untrusting of Alexander's camp, isolated himself leaving a question as to who was in charge. A failed plan to kill young Alexander prompted retribution and Elagabalus was murdered along with his mother on March 11th 202, their memories condemned and their bodies thrown in to he Tiber. 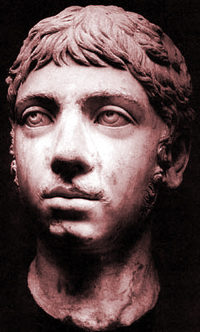 Elagabalus was a teenager raised in luxury lacking in the experience and discipline needed to rule an empire and in the end he alienated and offended most of those around him once on the throne having largely ignored the business of the empire.